Are you ready to file your taxes under the new rules? This is the first year under the big changes, and CPA Mike Grinnan is on hand to cut the confusion. Early meeting: Mike Butler on QuickBooks Pro. Mike Grinnan, KREIA's treasurer, is a CPA who keeps his finger on the pulse of tax changes. If you have questions about what's new and what's different under President Trump's tax overhaul, you need to come to our February meeting! You'll get all your questions answered, and you might learn something that will save you a bundle. Last year we had a full house for Mike's tax meeting, and you won't want to miss this one. Register now! 5:30 p.m. Early Meeting: Do you want to find out the best way to keep the books for your real estate business? 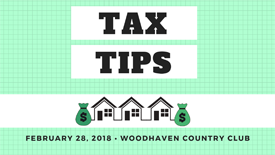 Mike Butler, author of the best-selling "Landlording on Autopilot," and a master expert on QuickBooks Pro, will be in the house making you envious describing how easy QuickBooks makes his tax-time preparations, and how it can handle EVERYTHING real-estate-related with ease. And if his short presentation piques your interest, you'll want to attend his full-day QuickBooksPro workshop on Saturday, March 2nd. This month we've got Mike to the Power of 2 delivering a knockout punch to your taxing issues. You gotta be here!